The U.S. Federal Government has adopted a “cloud first” policy that requires agencies default to cloud-based solutions whenever a secure, reliable, cloud option exists. The National Institute of Standards and Technology (NIST) has issued a three volume Cloud Computing Technology Roadmap and initiated a standards acceleration program so that best practices from the private sector can be used for government systems immediately, without a protracted standards process. The motivation for this unprecedented initiative is clearly economic. 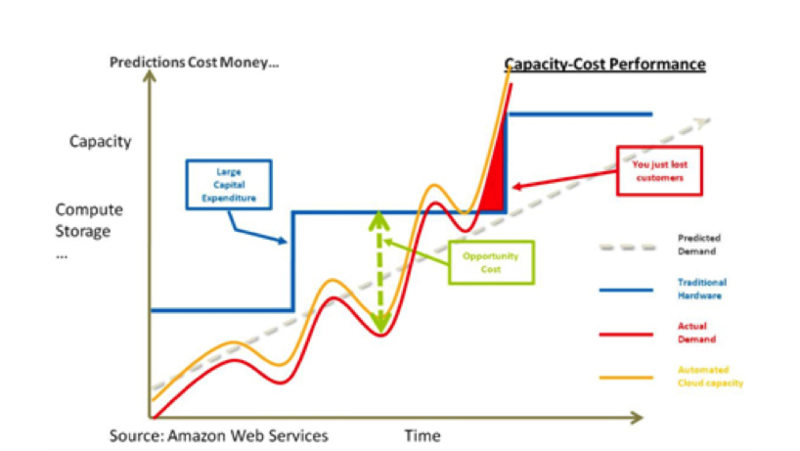 Figure 1 shows the cycle of excess and insufficient capacity inherent in premise-based systems, versus how cloud based infrastructure scales quickly to meet, but not exceed, demand. A Booz Allen Hamilton Study (Figure 2) compared the cost of 1000 premise based servers with equivalent capacity in public, hybrid, and private cloud environments. Their findings show that shared infrastructure alone results in 50-70% life cycle cost savings. Furthermore, the cost of the cloud itself is decreasing dramatically. The cost to run a basic Internet application on LoudCloud in 2000 was $150,000 / month. Running the same application on Amazon today costs $1500 / month, two orders of magnitude less. It is a conservative expectation that we will see still another order of magnitude reduction within the current decade.